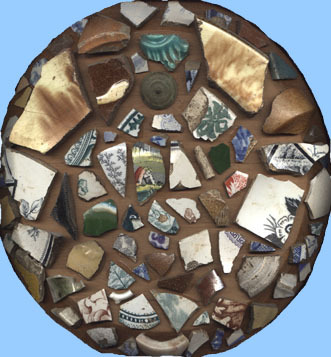 A selection of pottery shards, clay pipe stems, pieces of glass, plus a circular metal artifact of unclear function. All appeared out of the soil in my garden......I can't help wondering who put them there, and when. There must be dozens of plates, saucers cups and so on represented here, so where are the rest of the bits of all these items....?